Every once in a while a device comes along that defies classification. It might not always work out, but when it does, it could be revolutionary. The last such device was the Samsung Galaxy Note. Initially greeted with apprehension, the Galaxy Note eventually garnered positive reviews and of course criticism as well. Nevertheless, it sold in good numbers worldwide and was declared a success. In Computex Taipei, Asus revealed it’s newest and most radical device, the Asus Taichi. It is a tablet and a laptop in one or rather, a hybrid notebook computer. So how does it work? The Asus Taichi looks like an ordinary notebook computer, except the back panel is actually a screen! Open it up and you’ve got a laptop, close the keyboard and you’ve got a tablet PC. It’s basically two devices in one, how cool is that? While exact specifications are not yet released, the Asus Taichi is said to feature the latest 3rd generation Intel Core i7 Processors (Ivy Bridge), 4GB of DDR3 RAM and SSD + HDD storage. There will be two cameras, both front and back, so there is a camera for both device forms. 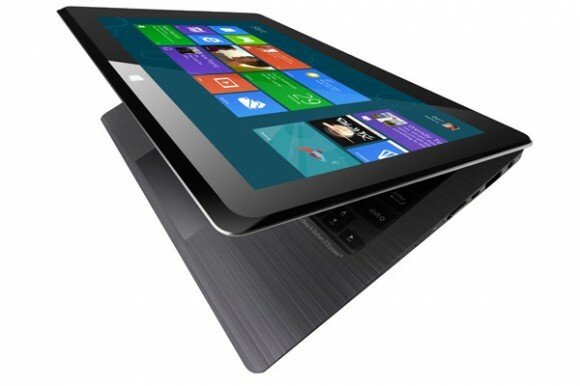 Even though it’s convertible and all that, the Asus Taichi will weigh as much as and be as thin/compact as an ultrabook. It will also feature Bluetooth and Wi-Fi capabilities. Of course, only the outer screen will feature touchscreen capabilities, but both the tablet and notebook screen will run at 1920 x 1080 or 1080P resolution! The Asus Taichi will come in 11.6 inch and 13.3 inch dual display variants. No matter the variant, both screens will be 1080P, so you’re not sacrificing any quality. Apart from this, there will be options for usual customization such as different RAM, storage media and such. No word yet on colors or any other cosmetic customizations but it’s bound to have color variants. Having two devices in one is already a revolutionary idea, but there’s more. When opened, the notebook PC and the tablet PC can be used simultaneously! The notebook PC uses the full size QWERTY keyboard and trackpad for input while the tablet uses the touchscreen. Both devices can be used together and they even feature separate ports. Speaking of which, there will be an micro HDMI port, USB 3.0 ports, the works. The rear facing camera will be 5MP and the front facing one will be about 1.3MP. Also, both screens can be used to display the same task apart from working separately. Moreover, the Asus Taichi will be NFC capable. The idea of the Asus Taichi is radical, no doubt about that. However, is it practical having two screens? Sure, having a tablet for those non intensive tasks and a full size laptop available whenever needed is pretty cool. But consider this, in laptop mode it’s just like any other laptop, but in tablet mode it becomes a rather large tablet which sort of defies the idea of portability for some. Stay tuned to CoolPCTips for further details and let us know what you think of this tabtop or laplet or whatever you want to call it!